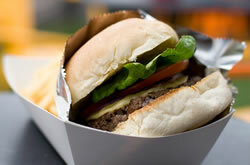 Burger Adventure is a blog that reviews the best burgers from Australia and around the world. Created by four guys with a passion for beef, buns, cheese, lettuce, tomato, onion, egg, bacon & sauce. Herein lies a list of our best hometown burgers from 2010. A classic Melbourne icon. No Top 10 list would be complete without it. Good double cheese. Good beef. Good burger. You know a burger is good when it doesn't even need cheese. The beef was simply perfect and cooked with the right shade of pink. Contrast to most other burgers, it is placid and relaxed. All of its flavours melt in your mouth creating an all around excellent experience. This burger is all about the Wagyu beef pattie. Amazing Zuni pickles and peppery sauteed onions make for a really classy hamburger. This was honestly pretty special. All of the ingredients were of the finest quality. Such an elegantly creamy burger. This burger had one of the thickest patties we have ever seen. Even so, it was absolutely cooked to perfection. It starts off with a foursome of Butter, Egg, Mayo and Cheese, and continues to get even better and messier. Your ultimate 3am burger-fix. Perfect ratios of quality beef, tomato sauce, mayo and an outstanding bun, teamed up to create a simple and unashamedly awesome burger. All the produce used is of an ultra high-quality, creating what can only be described as royalty amongst burgers. The time, research, energy and enthusiasm in all aspects of this burger have definitely paid off. All that's left to say is.. GOD DAAAMN!